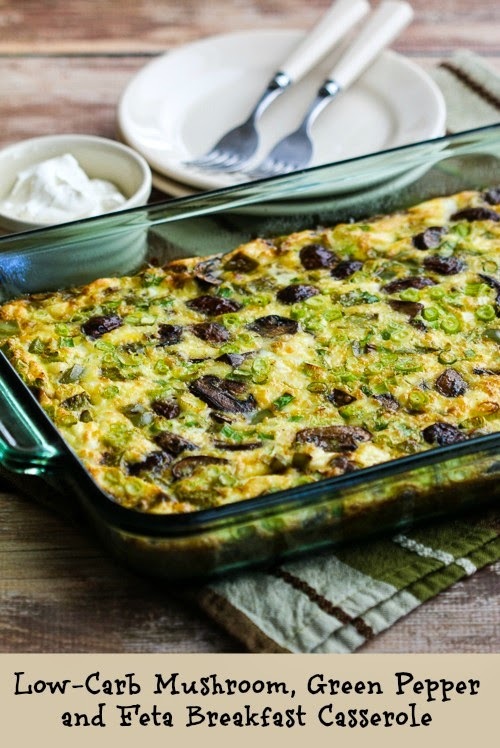 Make this Low-Carb Mushroom, Green Pepper, and Feta Breakast Casserole on the weekend and eat it all week! It's been more than ten years now since I started on my personal journey of carb-conscious eating, and if I had to pick one thing that's helped me to stick with lower-carb eating, it would be low-carb recipes that can be made on the weekend and then reheated during the week. And there's no doubt that topping that some type of Low-Carb Breakfast Casserole would top my list of things to make every weekend. Just taking a few minutes to get a breakfast casserole like this into the oven gives me an easy breakfast that just takes a few minutes to reheat, and gets my week off to a good start. This Low-Carb Mushroom, Green Pepper, and Feta Breakfast Casserole is something I first made back in 2007, and this combination for a meatless breakfast casserole is still one of my favorites. When I first made this recipe I liked using 18 eggs to a breakfast casserole like this, but now I prefer more veggies and cheese and a little less egg. Breakfast casseroles are a great way to use leftover vegetables, so if you have anything in the fridge that might go well with mushrooms, bell peppers and feta, go ahead and throw it in! And if you're a fan of eggs for breakfast, don't miss Ten More Delicious Meatless Recipes with Eggs after the recipe.